The World War II Memorial, located on the National Mall in Washington DC, is a beautiful place to visit and pay your respects to World War II veterans. The memorial opened to the public on April 29, 2004 and is operated by the National Park Service. The Memorial is an oval shape with two 43-foot arches, representing the war's Atlantic and Pacific theaters. Fifty-six pillars represent the states, territories and the District of Columbia at the time of the World War II. Two sculpted bronze wreaths adorn each pillar. The bases of granite and bronze are adorned with the military service seals of the Army, Navy, Marine Corps, Army Air Forces, Coast Guard and Merchant Marine. Small fountains sit at the bases of the two arches. Waterfalls surround a wall of 4,000 gold stars, each one represents 100 U.S. deaths in the war. More than two-thirds of the memorial consists of grass, plants and water. A circular garden, called the "Circle of Remembrance," is enclosed by a two-foot-high stone wall. 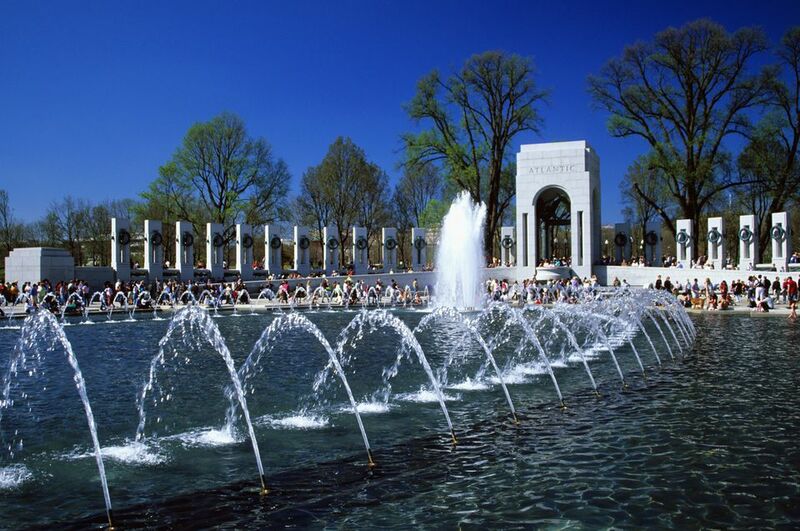 The World War II Memorial is located on the National Mall with the Washington Monument to the east and the Lincoln Memorial and the Reflecting Pool to the west. Parking nearby is limited, so the best way to visit the memorial is on foot or by tour bus. The closest metro stations are the Smithsonian and Federal Triangle stops. The World War II Memorial is open 24 hours a day. Park Service rangers are on site seven days a week from 9:30 a.m. to 8 p.m. The Memorial is a great place to linger and enjoy the panoramic views. Visit on a nice day and take some time to read the inscriptions and sit by the fountains. Attend a free ranger guided tour and learn more about the history of the memorial. Special wreath-laying ceremonies are held on Memorial Day and Veterans Day. These events are open to the public and a good time to visit. The water features enhance the aesthetic appearance of the Memorial. It is not appropriate to wade in the waters. Founded in 2007, the non-profit organization is dedicated to ensuring that the legacy, lessons, and sacrifices of World War II are not forgotten. Friends sponsors an annual public lecture series featuring prominent historians; provides teachers with curriculum materials; and collects and archives video interviews of World War II veterans and other members of the Greatest Generation. The organization also plans major national commemorative events annually and sponsors a dozen free public performances of military bands at the Memorial.